In this second most common reactor, boiling occurs directly in the reactor core; it is used mainly in the United States, Sweden and Japan. 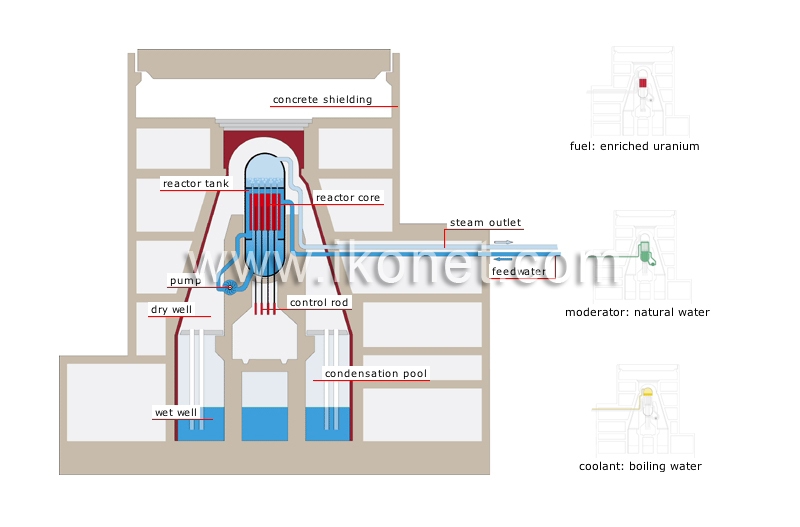 Steam produced in the reactor tank is carried to the turbine to produce electricity. Water-filled basin that is used to lower the pressure in the reactor tank in the event of an accident. Compartment around the reactor tank; it holds back radioactive products in the event of an accident. Device that continuously circulates water inside the reactor. Safety containment wall that separates the reactor from the rest of the building. Piping that carries water from the condenser into the reactor tank, where it is converted into steam. Compartment containing water that reduces the pressure in the dry well in the event of an accident. Boiling water: natural water that boils and vaporizes on contact with the heat released by the fuel. Enriched uranium: uranium produced by treating natural uranium to increase the quantity of fissionable isotopes (uranium-253) contained in it. Natural water: water found in its natural state.